Blood on the Dance Floor is the latest work by multi-disciplinary theatre-maker, dancer, choreographer and puppeteer Jacob Boehme in partnership with Ilbijerri Theatre Company which premièred June 1 at Arts House. 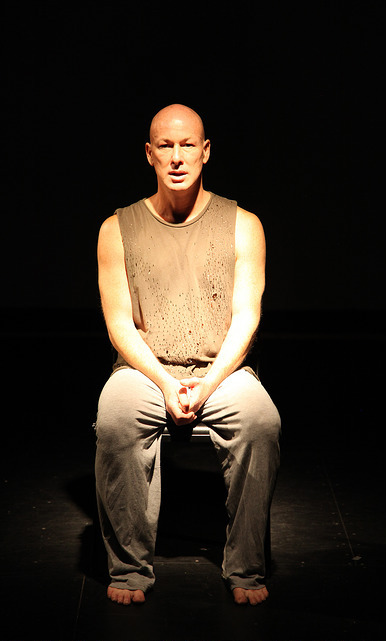 Drawing on the motif of blood, this autobiographical dance-theatre work is made up of stories which collectively tell the story of Boehme, a gay Indigenous man who is HIV positive. Drawing on a variety of Indigenous dance forms, Mariaa Randall’s choreography is exquisite, skilfully crafted for Boehme’s powerful grace. There seems to be story woven into the choreography that is just beyond my comprehension; it’s like seeing something at the very edge of my vision. 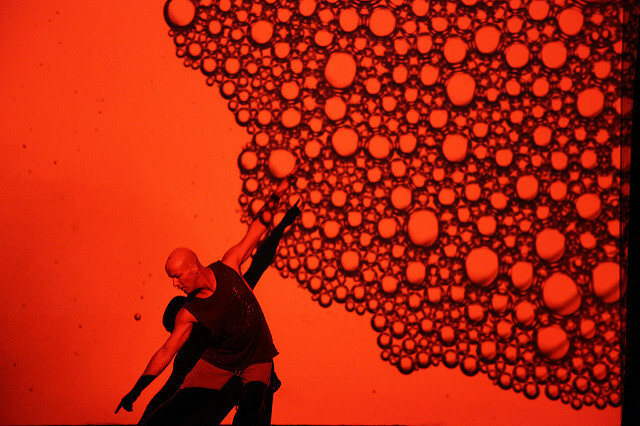 Boehme is utterly mesmerising as he dances, his magnetic presence on stage draws you in so completely that it is impossible to see anything else. It wasn’t until after the show that it occurred to me that there was considerably less dance than I was expecting, but I didn’t feel its absence at the time; every moment of the show is delivered exactly how it needed to be. Blood on the Dance Floor engages with some harrowing themes: the horror of the AIDS crisis, the stigma and loneliness which often haunts a HIV positive status, the trauma of the Stolen Generation. It deals with these heavy issues with a light touch, as if it is assumed that the audience is already sensitive to the violence inherent in these themes, and we are compassionately lead through the work by the direction of Isaac Drandic. As the program notes say, the show is about love – Boehme’s love for his boyfriend, his dad, his friend Anthony, his family. It is love which gives this work a buoyancy which carries us until the house lights come back on. The show is a spiral of stories, strung together seamlessly through multiple mediums: dance, monologue, poetry, James Henry’s soundscape and Keith Deverell’s stunning videography. Ultimately, however, the primary medium of Blood on the Dance Floor is story-telling itself. Boehme is carrying stories in his body, and as the hour progresses, stories slip out, breathe, and go back in as another story emerges. Boehme opens the show as Percy, the aged queen (“I’m the epilogue, apparently!”) who with darkly crass humour relates her account of the AIDS crisis. He dances into himself, Jacob, nervous about a date with a man he’s bee n seeing, agonising over telling him of his HIV status. We witness Boehme’s uncanny metamorphosis into his father who yearns for grandchildren, instructs his son on how he wishes to be cremated, and tells him the story of when he encountered an unknown elderly Indigenous woman and “there was something about her eyes.” She was his nanna, a survivor of the Stolen Generation. My tears blur the fire burning in the background as Boehme sits and tells us of his friend, Anthony, who was rejected by his family for his “sick blood” and committed suicide. Boehme disrupts our immersement in the web of stories he has crafted around us when he abruptly stops and walks directly into the audience, takes out a bottle of pills and gulps some down with water, panting after his exertions on the stage, and we are forcefully reminded of the corporeal reality of his body, a dancer with a chronic illness. Elsewhere, Boehme has stated that one of his main objectives for Blood on the Dance Floor was to “bring Indigenous ways of making theatre to the fore rather than as an afterthought.” I found this statement immensely exciting and was greatly looking forward to seeing it manifest. Blood on the Dance Floor is extraordinary theatre and Australia would benefit greatly from more work of its kind.